Global Conservation Status: �Loggerhead Sea Turtles are�listed as�Endangered�by the IUCN Red List.�Their NatureServe Global Conservation Status Rank is G3 (Vulnerable). Federal Conservation Status: �The Loggerhead Sea Turtle�is a federally threatened species. 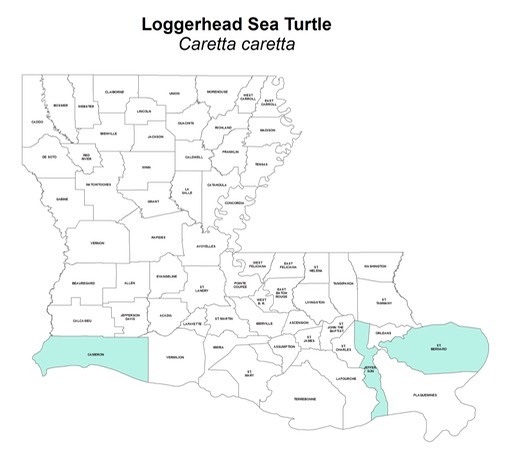 Louisiana Conservation Status: �Loggerhead Sea Turtles, when breeding, have a ranking of S1B (critically imperiled because of extreme rarity – 5 or fewer known extant populations). When nonbreeding, Loggerhead Sea Turtles have a ranking of S3N�(rare and local throughout the state – 21-100 known extant populations). Additionally, Loggerhead Sea Turtles have a State Protection Status of�‘threatened’,�meaning�taking or harassment of this species is a violation of state and�federal laws. Author's Remarks: �I have never observed this species in the wild.